I'd like to introduce my friend David, a former pro-am skateboarder who's slightly fashion challenged for the real world. As what happens to most of us in our 20s, we grow up and have to get real jobs. After getting laid-off and job searching for six months, David's finally landed himself a job in corporate America. Gone are the days of chilling at home in lounge clothes - it's time to go to work! And with that comes a new wardrobe. While he rules the bowls at the skate park, he's clueless and has little patience for shopping. Since he's been so nice as to photograph most of my outfit posts lately, I'm helping him assimilate his professional wardrobe. 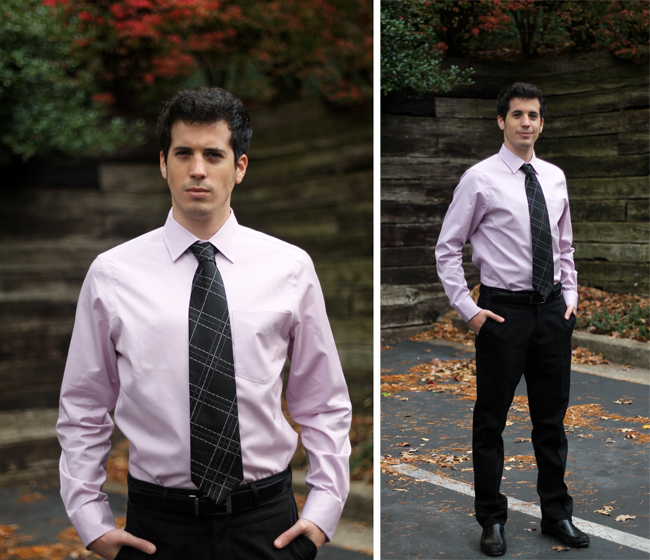 Here we are documenting David's adventure into proper dress code on a budget! With a tight budget, we started at Goodwill and other local thrift stores. We checked a few in the area and found several items. With David's 5'9" stature and slim build, most of the shirts were way too big. There was a huge selection of Medium through Extra-Large, but we need a Small for David, so we ended up with one thrifted dress shirt. I scoured the tie-rack and found two nice ones at Goodwill, and two nices ones (including a Christian Dior tie) at another thrift shop. Finally, we found two pair of pants in his size (and he found a reversible black/brown belt on his own). These are some fabulous deals, but not enough to get him through a work week! Since we exhausted the stores in our area and were on a time constraint, the next stop was the outlet mall. We got lucky at the Saks outlet and found two Saks brand dress shirts, one Saks brand pair of pants and a pair of Cole Haan shoes. Heading over to Gap and Banana Republic, we picked up an additional pair of pants and another shirt. 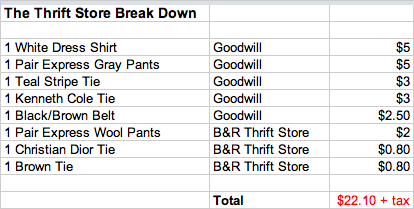 So in total, David spent $257.86 + tax for 4 dress shirts, 4 dress pants, 4 ties, 1 reversible belt, and a pair of shoes. Not so bad, eh? We could've gotten more mileage from the thrift stores if David was much bigger, or interested in oversized pleated pants from the early '90s à la MC Hammer, but alas, I put him on a flat-front-pants-only diet which limited our selection, as well. I thought this was a great shirt from Saks - it's 100% pima cotton with a subtle sateen woven stripe and coming in at less than $30. These pinstripe Express pants from the thrift store are 100% wool and in okay condition - I noticed a tiny hole near the hem and a hole is forming near one of the back pockets, but considering they were $2, they'll get him through a few weeks of work until he can find another pair. 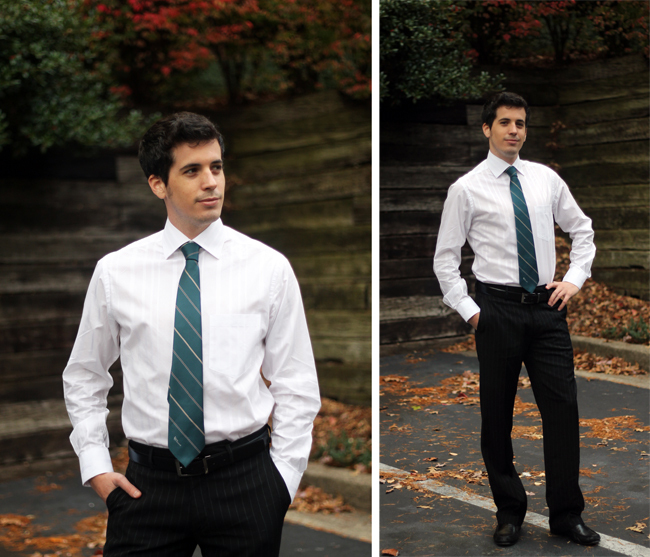 I love the color of this tie - it's a nice teal with neutral-hued stripes. Here's one of our best finds. This Christian Dior tie was only $0.80 (yes, 80 cents!) at the thrift store. Wow! It's a fabulous shade of gray with navy, burgundy, and white stripes. It is paired with this Italian-made 2-ply cotton gray and white striped shirt from Saks. These thrifted Express pants are in good condition - a little fading is visible around the seams, but at $5, they'll get him through a few months of work. Here's another great tie deal - I found this Kenneth Cole tie for $3 at Goodwill and it's in excellent condition. I've since decided that it's slightly dated in width and maybe some fashionable guy donated it because of that. I plan to make it narrower (another project added to the sewing to-do list). And the pants - I love the slim cut and they came in under $16 at Saks, wow! 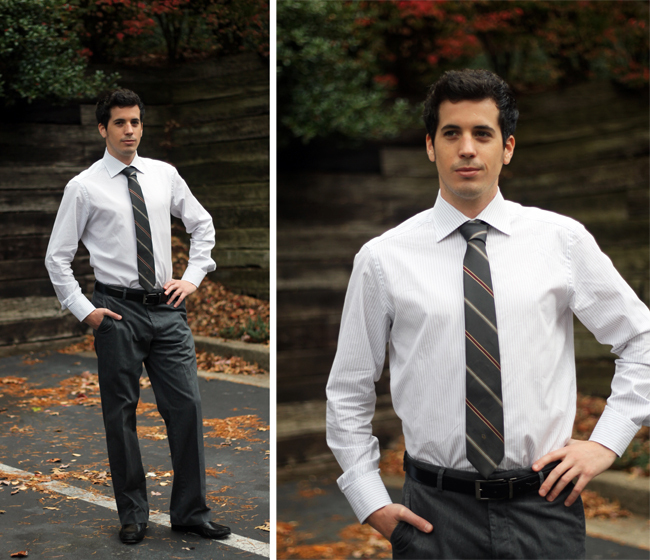 Yes, we know the tie is tied a little too short in these pics. 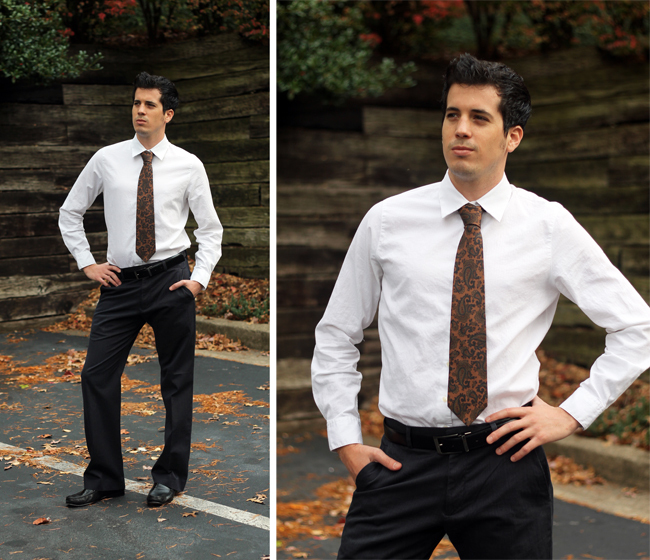 This last outfit incorporates a cognac-colored paisley tie I spotted for $0.80 and a $5 white dress shirt. We paired it with these cotton navy pin stripe pants from Gap, the thrifted belt, and the Cole Haan shoes. 1. Look for relevance. If it's dated from 15 years ago, you probably won't wear it. And I mean mostly yucky '80s and '90s stuff - prior to that, fantastic vintage items are fair game! 2. Look for flaws. Evaluate the condition of a garment against the price. If there's a few minor flaws and the price is super cheap, it might be worth it (at least until a replacement can be purchased). 3. Consider sizing. Is it going to cost a lot to tailor or hem a garment? Can you alter it yourself or do you have a friend who will do it for cheap/free? Weigh tailoring costs against garment condition and price. 4. Consider your time frame against your budget. Do you have time to drive all over the city searching different thrift stores? Sometimes ya just can't find anything good at a thrift store - it's a chance process. Do you have time to keep searching, or should you head to the mall/outlet? 5. Know when to purchase new. We looked for shoes at the thrift store but there were slim pickings in David's size and they weren't in great condition. We were running out of time and found these $200 soft leather Cole Haan shoes with leather soles for less than $100. 6. Consider friends and family as resources. Maybe someone just cleaned out their closet and has a bag of donations. It can't hurt to ask, especially if they are your size. Now David has enough outfit essentials to mix and match throughout a work week, or at least until he builds enough budget to buy more clothes. Readers, can you give any more suggestions? Did we miss anything? A coat and suit are still on the list. Thanks for reading! 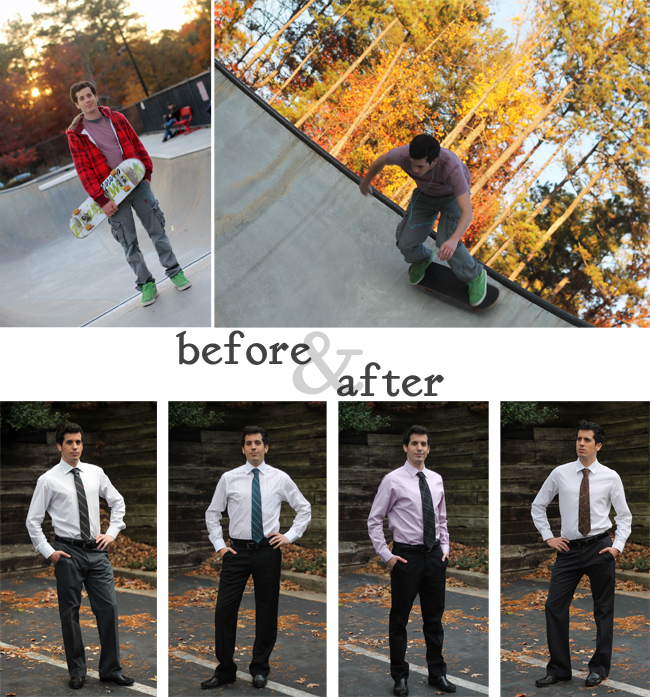 David will have to save his skate clothes for hours before and after 9 to 5! WHAT??? I come all this way and wait 24 hours only for this? A makeover??? LOL! Maryann you did an awesome job, and David looks ready to tackle the real world! You found some fantastic pieces and I love Saks Outlet...gahhh! Wow. This is so impressive! David looks like such a fun guy...and certainly handsome in his new duds!! :-) He's so lucky to have a resourceful + stylish friend in you! PS - fantastic thrifting tips too!! Look at him being all swanky!! He is so handsome. Haha, this is a great idea for a post! Lord knows my gentleman needs a makeover like this. Looks great! I bet you guys had a lot of fun with this post. Tell him congrats on landing a job! That's amazing. i love Goodwill. WOWOWO!!! Whatta cool blog! It's sooo rocking'! And I love how you went to the outlets and showed what you spent and before and after...soo clever! u look hot! Great makeover, he looks great and on a budget!! That is awesome.